Our 2016 Fall meet was held in Elkhart Lake, WI. A huge thanks to Andy Mikonis, Carlton Schroeder and Brian Frank for hosting a fabulous meet. There were many activities and events to enjoy. Rain greeted many arriving members and their cars on Wednesday but the weather improved quickly during the course of the meet. Thursday featured cruising in our Chryslers to the nearby town of Plymouth, WI including a lunch stop at Chester's drive-in. The afternoon included the concours judging and a car wash area. 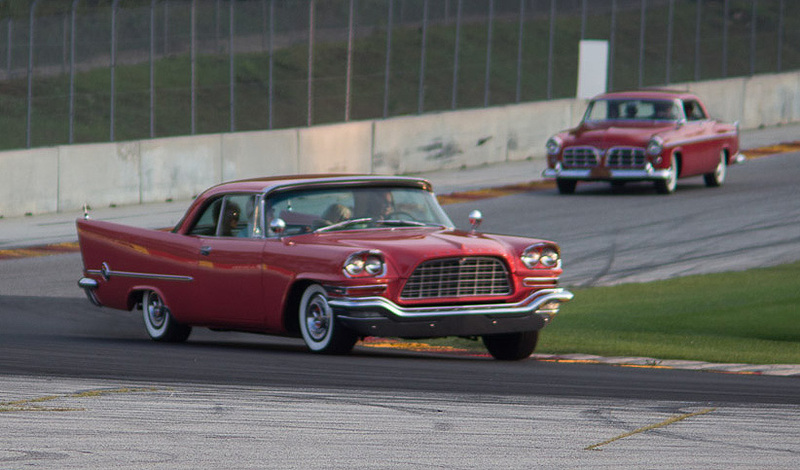 Thursday evening featured the signature event of the meet, the sunset cruise on the track at world famous Road America. 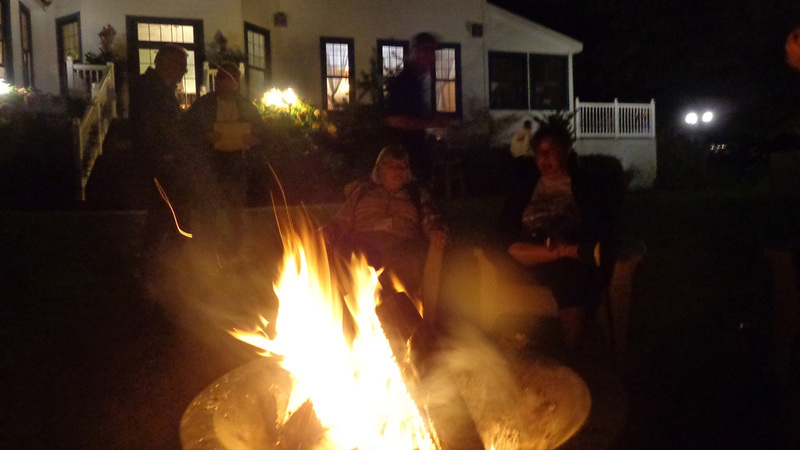 At night, many enjoyed a traditional Wisconsin fish fry dinner at the Victorian Village Resort. Friday's events included a cruise over to Oshkosh, WI that included a lunch stop at Ardy & Ed's vintage drive-in from 1948, plus an informative guided tour of the world renowned EAA AirVenture Museum. On Saturday, the car show was held in our own lot on the grounds of the Victorian Village Resort under beautiful partly sunny skies. 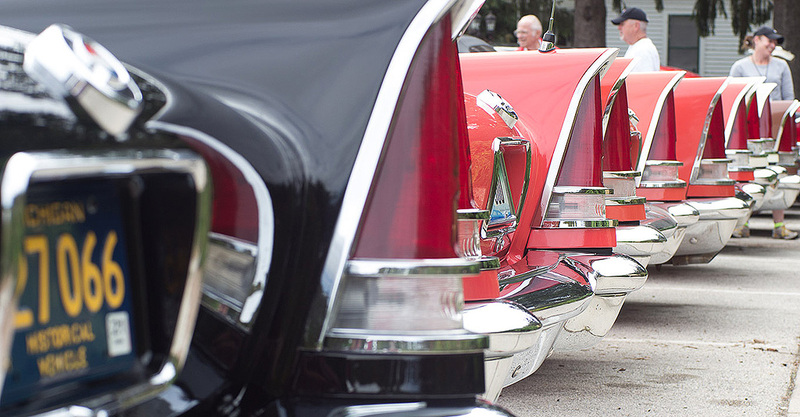 We had a very large representation of letter cars and other vintage Chrysler products, and several first time attendees. In the evening, the banquet was held at the Victorian Village Theater, which included the presentation of awards. http://ronaldnelson.zenfolio.com/p574627970 or on the web site ronaldnelson.zenfolio.com. Ron came out free of charge to the Club, so if you had your car out there, please consider purchasing a print. They look great and his prices are quite reasonable - as low as five bucks! Brian and Kathy Frank, Carole and Andy Mikonis, Barb and Carlton Schroeder. Hats off to the Gang for another great meet!! I had a great time, The EEA museum was everthing I expected and more. 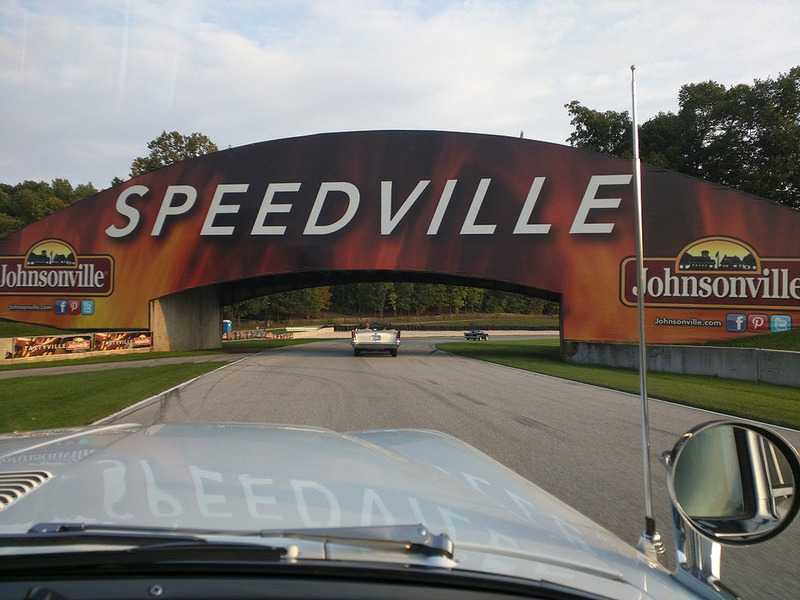 What a hoot driving the Road America course! If only the guy ahead of me would have got the heck out of his own and my way!! Every time I got to a curve with my speed set for the turn I was met by a sea of brake lights! My only regret was NOT bringing the F! See you folks in the spring! As a first timer to a 300 meet I want to thank you all for the warm reception and friendship. Sal & I and Mike & Michelle Swedal (who restored my "C-Biscuit") all felt the same way. I also want to thank the judges that perform a difficult job not only physically, but also have the burden of keeping criticism and suggestions constructive and positive which they all are masters at! I learned a lot about my cars and the tweaks that can be done to improve them which is exactly why I came to the meet. It is a gathering of true experts that can't be found all at once at any other meet. What a fantastic opportunity to learn! Thanks to Andy, Noel, Carlton. I could go on and on but my one finger is getting tired of typing and I'm sure you get the idea, see you all soon! Denny and I would love to thank you and the crew who put together such a great meet. We had a great time meeting so many walking encyclopedias regarding the 300s! Boy, do I have a lot to learn. As a note to any who have who have never attended a meet, believe us when we say we "first timers" were welcomed and greeted with open arms. It was a pleasure meeting you all and maybe someday we will see you at a meet in Minnesota. Thanks to Andy, Carlton and Brian for a great meet. Everything was super - the site, the activities and, of course, the company. It was especially nice to meet new people. That is one of the advantages of moving these meets around the country. Having missed the last couple of meets, we were reminded why we enjoy them so much. We will see you all in New York in the spring. Job well done by our intrepid hosts!!! After the wonderful people, the wonderful cars, comes the lapping of Road America. Should one of you snap-shooters have a photo of Bill Allen's 56 Dodge, hopefully one with my extra happy self inside with Bill and Marilyn on or near the track, could you send it to me at lwjett@gmail.com? Was a great day and I need bragging rights to the locals here in CA. Mick and I add our congratulations and thanks to Andy & Carol, Brian & Kathy, and Carlton & Barb. A terrific meet, beautiful location, great track. The cars made for a stunning car show Saturday and lunch on the deck overlooking beautiful Elkhart Lake with dear car friends was special (you could hear the sound of downshifts wafting over the hill from nearby Road America - sweet!). Good to see old friends, and to welcome some new members as well as a couple of long-time members for whom it was their first meet. Great meet! Thanks to all involved in setting it up. I really enjoyed running on the track again-my last race there was probably 1963. They have made many improvements to safety since then. Now if I could just keep that right front hubcap on! Learned much from talking to the other car owners and seeing so many in one place. Thanks to all. Just ordered the pictures-also great! 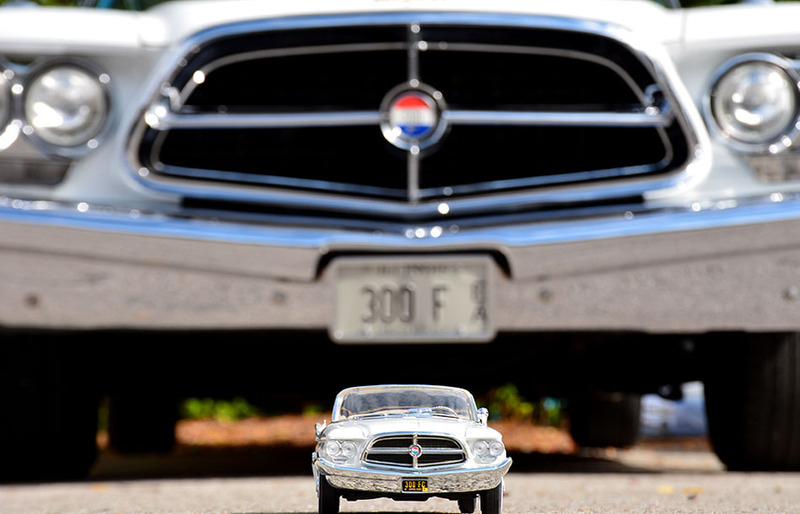 Check out this most excellent writeup of our meet by Bill Hall: https://blog.hemmings.com/index.php/2016/09/30/the-chrysler-300-club-gets-back-on-track-at-international-meet/ It really captures the essence of a Club Meet, and why if you haven't been to one, you should go. Bill was a big help to me with meet planning. We need to get this guy into a letter car. Following up on his terrific review of our Club's Elkhart Lake Meet in "Hemmings Daily"
October 3rd online edition, Bill Hall has published this review of our Meet in classiccars.com. 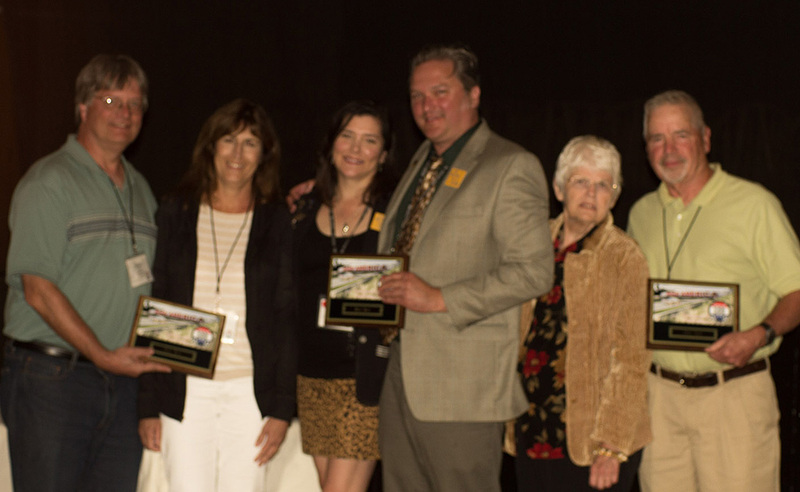 Mick Kreszock, Noel Hastalis, Bob Merritt, Gloria Moon, Mark Obermann.